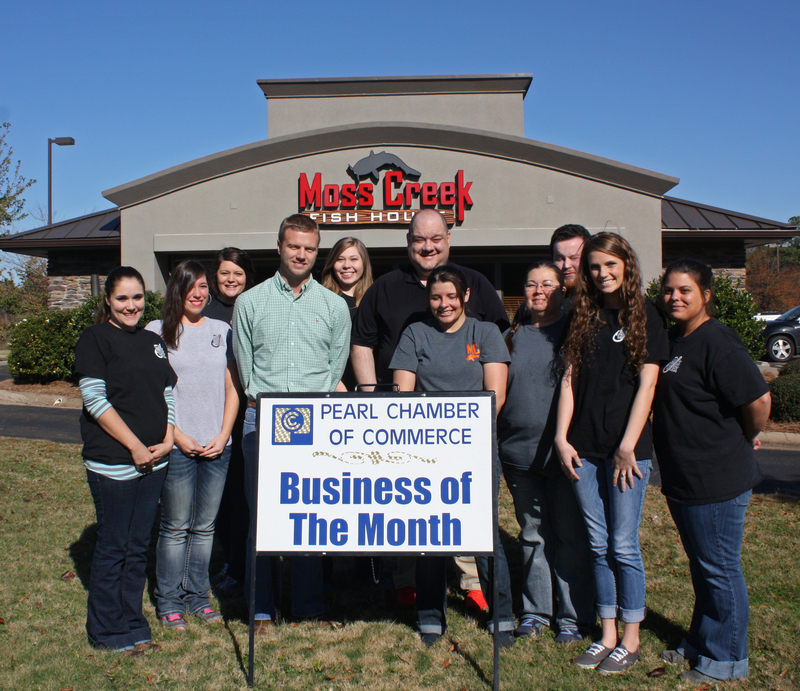 Moss Creek Fish House, located at 413 Riverwind Drive in Pearl was selected as the Pearl Chamber of Commerce December Business of the Month. Moss Creek has been an active community partner and chamber supporter since they opened in July 2012. They specialize in U.S. Farm Raised catfish and seafood. From the pond to your plate, the catfish that is served at Moss Creek is always fresh and never frozen. All of the cole slaw, tartar sauce, cocktail sauce, turnip greens, hush puppies, alfredo sauce for their chicken alfredo and other homemade items are made fresh daily. One of the specialties is their delicious homemade gumbo, served by the bowl or can be ordered for take-out in larger quantities. They are one of the only restaurants in this area that serves thin and crispy fried catfish. Moss Creek has a variety of homemade desserts including their famous pecan cobbler. They can cater events both small and large and they have a separate dining room that is available for private parties. The hours are Monday through Saturday 11 a.m. until 9 p.m. and on Sunday evening from 4 p.m. until 9 p.m. Shown in the center is owner Matt Thornton and General Manager Mike McIntosh. For more information call 601-932-7424.